Using the sun's energy to heat your domestic hot water is clean and economical. Solar water heating is an efficient use of solar energy that has been largely overlooked. Cut your utility bill and decrease carbon emissions by harnessing the solar potential on your roof to meet your home or business water heating needs. This calculator is part of the innovative, award-winning SF Solar Map. 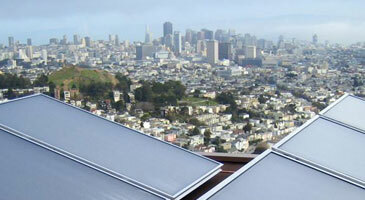 It allows San Francisco residents and businesses to evaluate their building's solar resource potential. Find your home or building on the map to see your solar electric or water heating potential. To accelerate the adoption of solar water heating systems in California, the state is offering incentives to install solar thermal systems on their properties. This calculator only provides a basic estimate to help San Francisco property owners get a first look at how solar water heating can benefit them.